Originally sold in the duty free shop of 'London' airport. This is a pure pot still Jameson that we think dates from not long after the second world war. Some interesting info on the back label states that the whiskey is made solely from malted barley, wheat and oats. The label is damaged and the level of liquid is just below the neck. The capsule includes an Irish Coffee booklet and the cork stopper is tight and appears to be in good condition. A really nice looking old pure pot still Jameson. This was bottled in Birmingham, UK by Liggins of C.. Most likely from the 1960s. 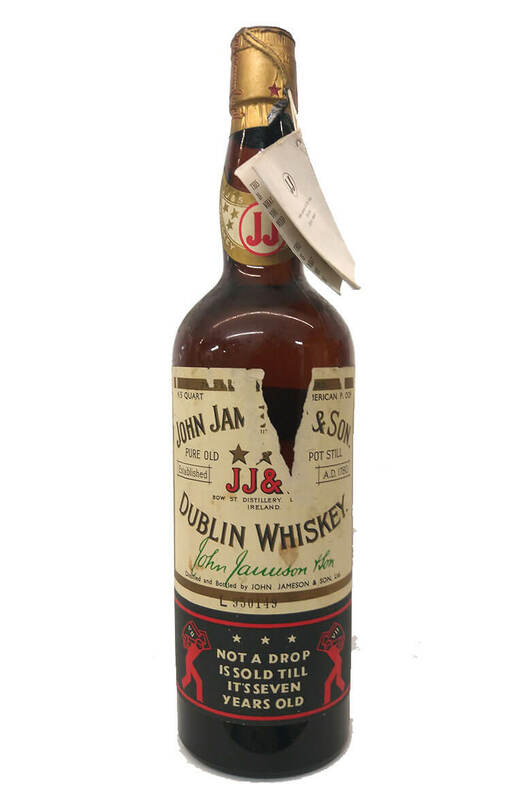 This Jameson whiskey was bottled by the famous firm of Alex Findlater an..